The Carton Flow rack system, also called Carton live storage, permits high density storage of cartons and light products, leading to savings in space and improved stock turnover control. 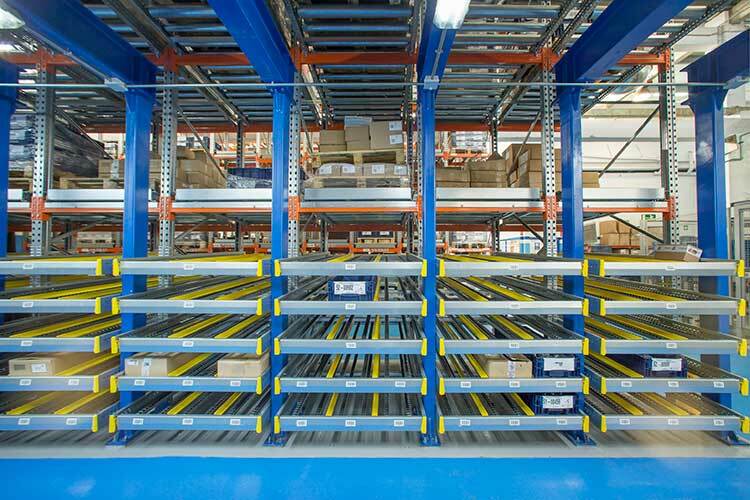 As with the live pallet racking system, perfect product rotation is ensured in this picking system by also following the FIFO (First in, First out) system, and interference is avoided by differentiating between the loading and unloading areas. 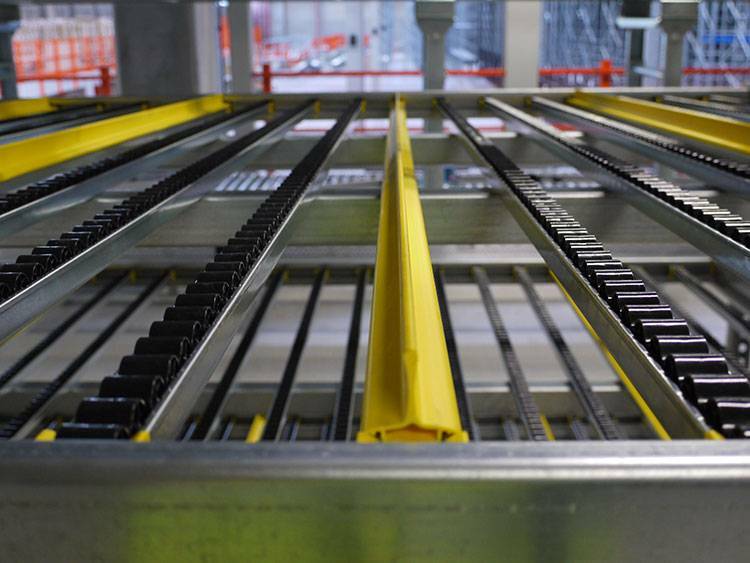 The Carton flow racking system reduces distances covered in the warehouse and saves operating time, so it perfectly adapts to warehouses with a large volume of manual picking operations. 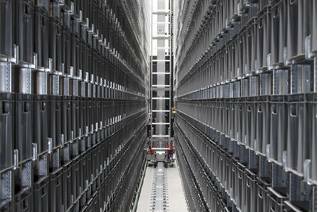 In the Carton flow rack or Carton Live storage system, goods slide along slightly inclined wheel carriers at the different lane levels. The wheel carriers can be easily adapted in the cross aisle direction to accommodate different unit loads, making this a very versatile system for carton picking. 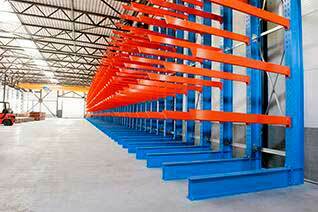 The Carton flow rack system is applicable to the range of storage needs designed for the picking operations. It therefore has a base frame consisting of the entry and exit profiles, side profiles and guide rails. 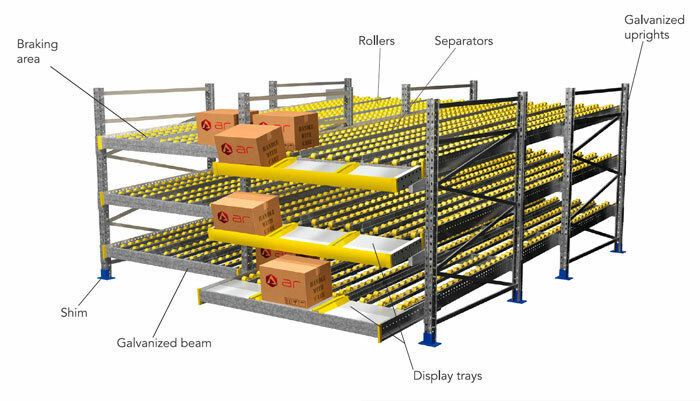 Carton live storage also has a wide variety of variable or optional elements that allow it to adapt to the specific needs of each installation or sector such as the display trays, straight platforms, separation, braking systems, etc. One of the great advantages of Carton flow rack is its simple adaptation in combination with other pallet storage systems. Utilisation of space. high-density storage system, i.e. same space but more storage capacity. Perfect product rotation: When applying the FIFO (First in, First out) system, the first unit load in is the first load out. Without passage interferences. 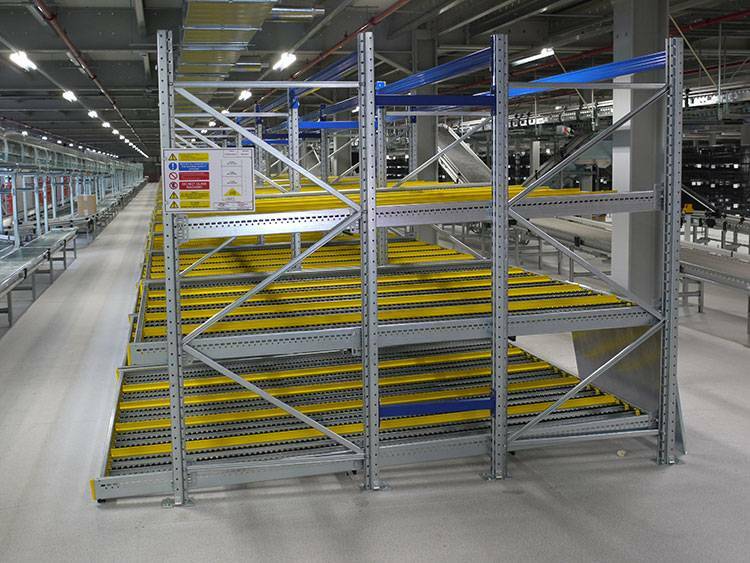 The load units are introduced and extracted in different aisles, as the loading and unloading aisles are separated. 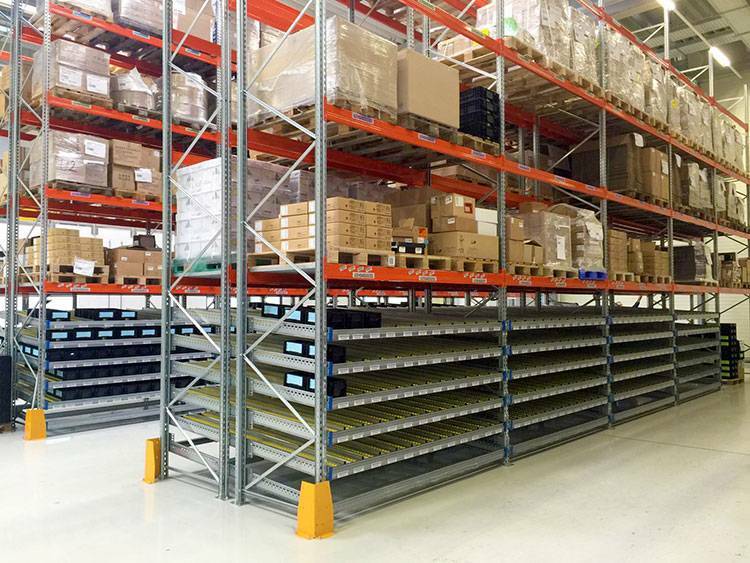 Carton live storage system is compatible and combinable with other AR Racking storage systems. Reduced operating costs thanks to the excellent use of space. 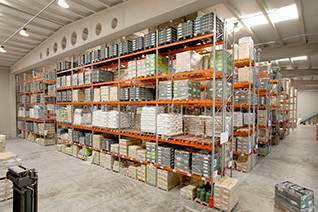 Allows the installation of pallet racking solutions at higher levels. Adaptable to different sizes and shapes of boxes and light loads. Also possible to modify the gradient and distances between pulley wheels. Easy installation. 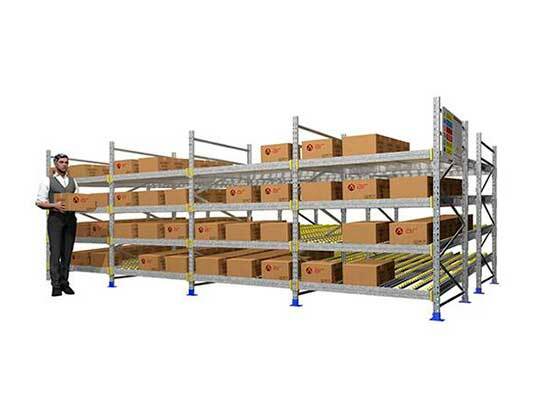 Carton flow rack does not require subsequent maintenance of the installation either. 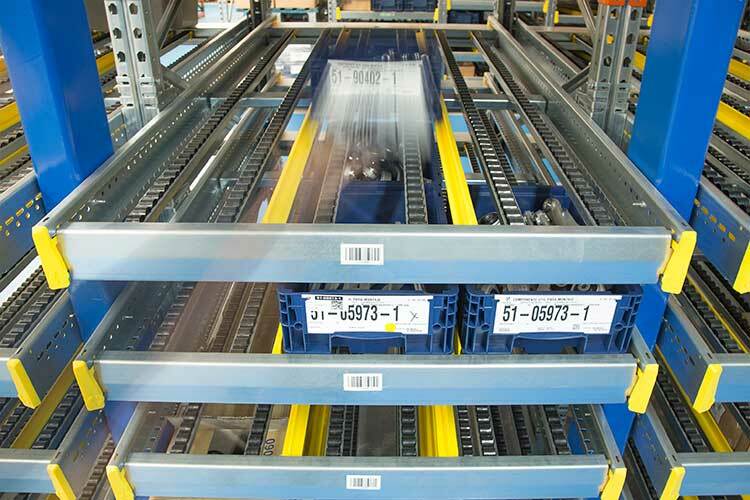 Reduced manoeuvring and displacement times of workers due to the higher number of references at the front of the racks; shorter journeys. Quick and simple extraction. The manual manoeuvring and extraction time of the unit loads is reduced due to the good location of the products. Possibility of simply installing order preparation systems with WMS (Pick to light) integrated in the storage solution.